I think I found my new favorite thing in Lit-Cube. 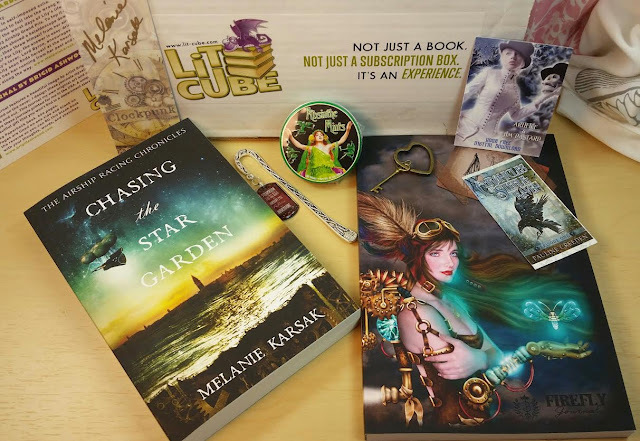 This is a monthly book subscription box that sends a hand chosen book that fits with the months theme (or rather it's probably the monthly theme that fits the book) along with a stash of fun, bookish items to enhance your reading experience. So, I'm a pretty prolific reader. I have to start off by saying that. I was initially worried that a book subscription would be difficult because I've read so much. 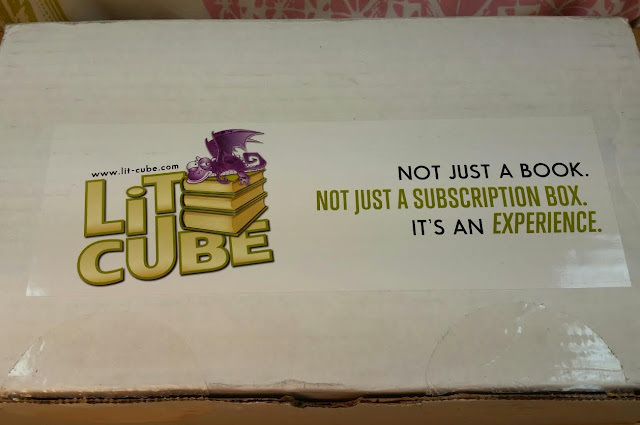 However, not only does Lit-Cube send award winning, best-selling books but they also send indie books and small to medium published books as long as they are great reads. This is good for people like me because it means I'm less likely to have read a book like that already. I'm really excited about this subscription! 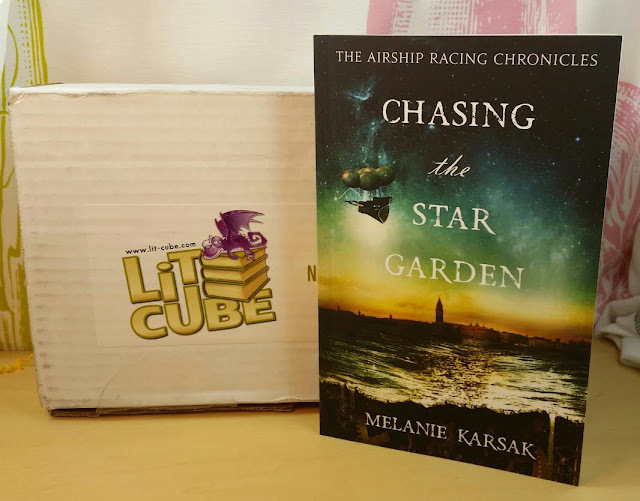 Chasing the Star Garden by Melanie Karsak- This is the first book in a steampunk genre duo "The Airship Chronicles." I adore steampunk. If I could cos-play as a steampunk airship captain, I would. Totally. This book is a little grittier than I was expecting and is definitely for an adult audience. If you are squeamish about sexytime, you likely won't enjoy it. There are a few typographical errors and I would have liked to have seen a better defined page break between flashbacks and present day since it threw things off several times for me. Character development could have been better but it's a fun story premise though it starts out trudging through a opium induced haze. Our beleaguered heroine manages to claw herself out of her cycle of destruction and leaves us wondering what she's going to accomplish in the second book without the self-pitying flagellation of body and soul. Brass Heart and Key-chain- This is a small brass key-chain with an old fashioned key attached. It's really cute and I'm going to add it onto my keys. Because I can. 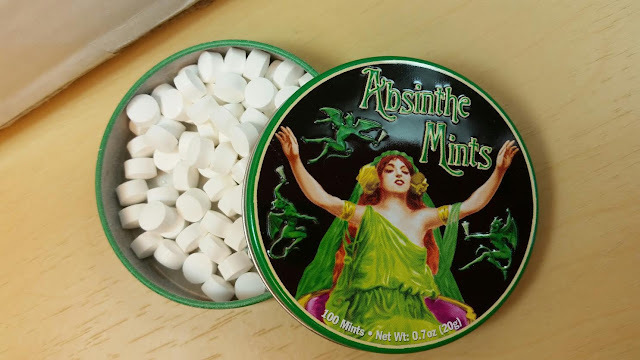 Absinthe Anise-flavored Mints- Absinthe features in Chasing the Star Garden as the drink of choice (with sugar cubes, of course) of the main character. Made of anise/wormwood and alcohol distilled with fennel and other herbs. While it is sometimes called "the green fairy," it does not actually produce hallucinations of any kind even though it was banned. It's now regaining popularity, though it's usually diluted and served heavily sugared. I love the taste of anise and licorice so these mints are tasty but I think it might be something you either love or hate-- like black jelly beans. Signed Clockpunk Bookmark- Clockpunk is the publisher of Chasing the Star Garden. It's signed by Melanie Karsak which is pretty awesome. You know, just in case she makes it to star status a la E.L. James and/or J.K. Rowling and this cardboard slab is suddenly worth a billion bucks. And no, I didn't read (or watch) Fifty Shades of Gray and yes, I did read Harry Potter... but only til book 4, then they got boring and I just watched the movies instead. Chronicles of the Steel Raven Episode One by Pauline Creeden- Since I have a Kindle, I'm always downloading new books and/or borrowing from my library systems digital catalog. This box is entirely free (you can get it free, too, using the link-- or just get the entire book for $2.99). It's only 57 pages long but there are several episodes. Subsequent episodes are .99 cents each. I haven't started reading this one yet but I'm intrigued by the Reaper aspect of it. Ice Demon by Elizabeth Watasin- This is also a free download from Amazon although it looks like you can also get it for iBook, Kobo and Nook. It's a short story in a Gothic Steampunk setting. There's a short sequel, too. VERDICT: I am so thrilled with the contents of this Lit-Cube. It delivers far more than my Uppercase Box did and cost less. 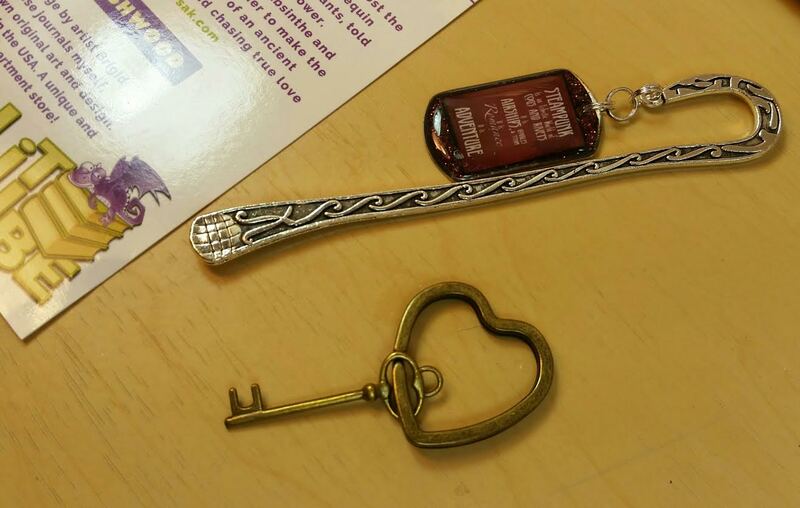 Not only was I introduced to a new book and author but I got some cute book goodies, too. Just the book and the journal make up the entire price of the box! I hope they include tea sometime in one of these boxes. I think that's a good bookish item. While the free downloads might be for short stories, I am glad of the inclusion because I never would have heard or read these authors if they hadn't been showcased in this box. I think I'm pretty lucky to now have three new authors to explore. I'm always looking for a good new series. 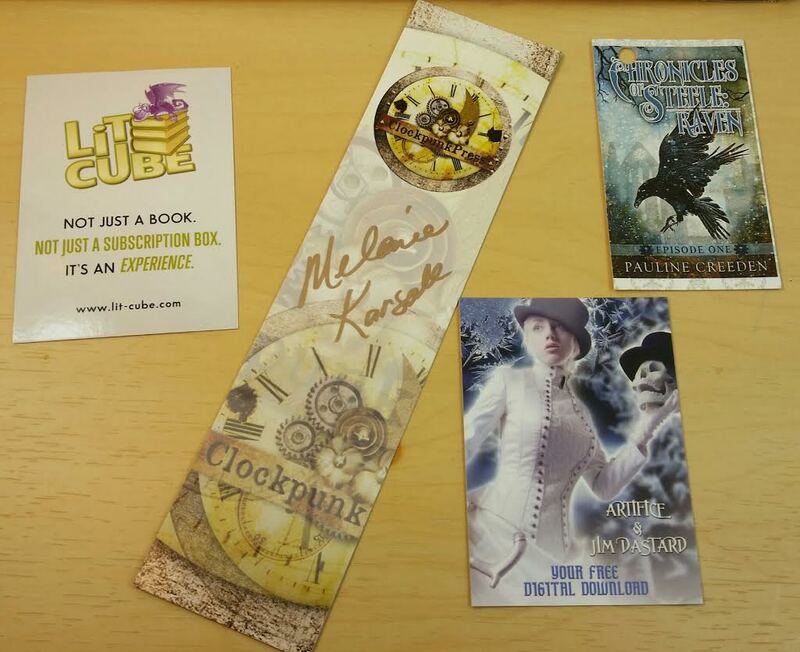 If you would like to sign up for Lit-Cube, you can do that right here! The July 2015 theme is "Mermaid Kisses and Starfish Wishes" so get ready! I wonder what they'll send! There are currently no coupons available but if you love books, I really do recommend this subscription. It's easy to sign up and you can cancel anytime via Paypal. What do you think? Do you have a favorite book subscription? 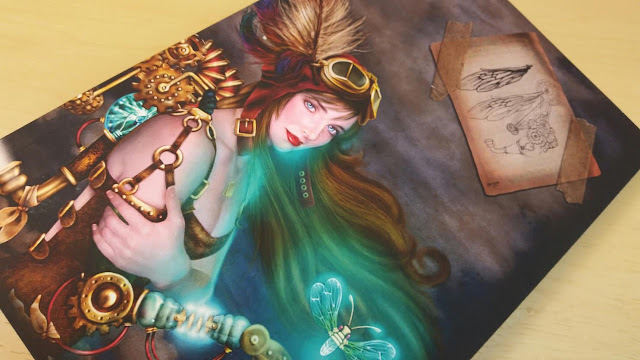 Any Steampunk genre book suggestions for me?! Oh, yes! Those were excellent! I just discovered those earlier this year and read them all. Speaking of werewolves, if you haven't read Anne Bishops Others Series, you should! I think it starts with "Written in Red." It's YA, too. I really like this box, I just wish it was a little cheaper. I think I would be more apt to subscribe if it was $20 and not $30. I agree. I think these are really geared toward bibliophiles who want to expand their collection while getting fun goodies like books signed by the authors, etc. The value is less tangible and more about expanding bookish horizons.